This Summer, CBeebies favourites The Octonauts are coming to a Sealife Adventure Park near you, ready to take you on a brand new deep sea adventure. glow in the dark sea creatures. Elliot loves the Sealife Centre and is constantly nagging us to take him there - he was quite excited to hear we would be visiting and checking out the new Octonauts event! On arrival in Weymouth the centre and carpark are well signposted and located within Lodmoor Country Park. Car parking is plentiful although you do have to pay for it. Once inside we headed over to the Octonauts area where we were able to take part in the interactive acitivities to discover how creatures of the deep use light to hide from predators , attract their prey and communicate with each other. Other features included puzzles, morse code cracking and even a chance to appear on screen with the Octonauts via the magic of the green screen and a photobooth! Octonauts, Kwazii and Peso, during an Octo-Glow Explorer character meet and greet. Elliot met Kwazii and he said this was his favourite bit of the whole day! 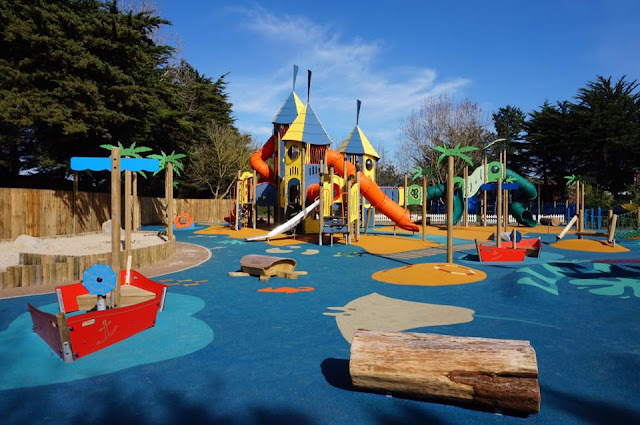 After meeting Kwazii we went off to explore the rest of the park including the much talked about Carribean Cove play area which opened earlier this year. It's a fantastic outdoor play area featuring slides, tunnels and all manner of play equipment. Unfortunately weather wasn't on our side and it was a bit wet to play for too long but this just means we will have to return another day to explore it properly! The park is home to over 1000 creatures and they are separated into different creature zones including rainforest, rockpool and ocean tunnel. You can see fish of all shapes and colours (you might even spot Nemo and Dory! ), otters, penguins, turtles, octopus, seahorses and many more. Elliot enjoyed looking at the tiny seahorses and amazing Weedy Seadragons in the nursery but my favourite was the Rockpool area where we learnt all about creatures native to the UK. Children (and adults) can learn so much on a visit to the Sealife Centre with information and facts scattered around each exhibit. Did you know that starfish eat by turning their stomach inside out?! The penguins are always fun to watch - one of them took a shine to Elliot. Everytime Elliot moved his arm, the penguin followed him up and down the tank! Sealife Weymouth has three food/drink outlets if you get peckish. We had lunch at the Adventurer's Grill cafe for lunch and everything was reasonably priced. It does get very busy in there although, especially at peak times and rainy days! The entire park is buggy accessible which is brilliant for families but there are plenty of parking stations around the park where you can leave your buggy if you want a closer look at the creatures. There are also locker facilities located at Crocodile Creek if you need to store your belongings. 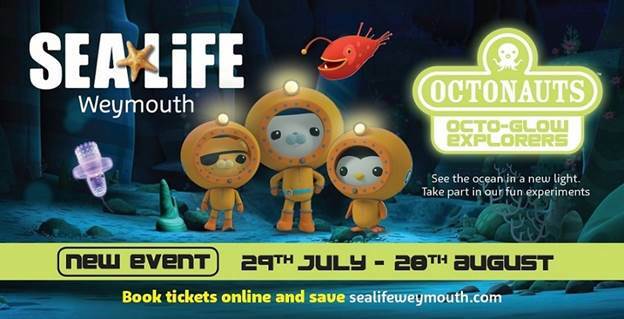 For ticket information, visit the SEA LIFE Weymouth website - usual admission tickets will cover entry to the Octonauts Octo-Glow Event which is running from 29th July - 28th August 2017. You can also find out more about the amazing marine conservation work that SEA LIFE does. We had a brilliant day out at SEA LIFE Weymouth and can't wait to return! My eight year old boy started jumping with excitement when I showed him this post and could not wait to attend this event. It looks so thrilling and exciting from the pictures.